Previously known as the ‘Hornets’ Jordan 5, this pair has recently been dubbed the ‘Pre-Grape’ 5s, and are available now for purchase! 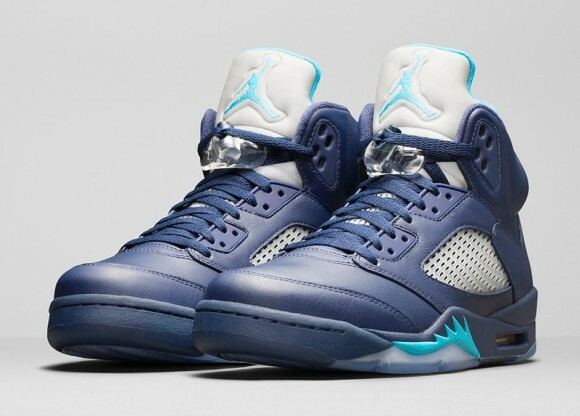 This colorway features a deep navy blue on the leather upper, as well as hints of turquoise blue on the inner liner, shark teeth, and Jumpman logo. Finishing it off is the reflective tongue, which compliments the icey sole and the netting on the side panels nicely. If you are a fan of the new “Remastered” Jordan line, then these could be right up your alley! Click the links below to cop for a price of $190. Let us know what you think!